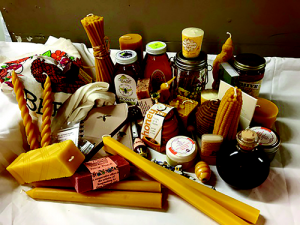 Beeswax Candles, Lip Balm, Soap – Gift Baskets! It’s October! Along with preparing for Halloween, the stores will be encouraging you to think about the Christmas season. So now it is time for you to make some plans for gift baskets. They are actually a wonderful way to advertise your honey and any other hive products you make. If you do make other products such as beeswax candles, lip balm, soap, you should check your supplies of those. If you need to make some more you have plenty of time. That is, if you start now! Not every item has to be from your own bees. If you buy these items from other beekeepers they would appreciate your letting them know now – not two weeks before Christmas when they are also too busy with holiday preparations. In addition to the assorted beeswax items, both mead and beer made with honey are good additions to gift baskets. These will have their makers’ labels on them. You may need to make certain those labels are legal. No health claims should be on labels for things like lip balm and lotions or, actually, for any other item. Just because you eat some pollen, a container of it would be a poor choice for a gift basket unless you are totally certain the recipient eats it. Pollen, and also propolis, can cause allergic reactions. Actually a gift basket does not have to be only for Christmas. A gift basket can be for a wedding, an anniversary, the arrival of a new baby, a birthday, someone’s retirement, welcoming a new neighbor, a small child’s birthday – what other celebrations can you think of? 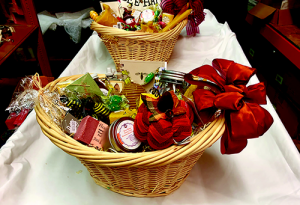 A bee-themed gift basket is the perfect gift for that someone “who has everything.” What other holidays and celebrations can you think of throughout the year? Easter, Valentine’s Day, 4tthof July, Thanksgiving, New Year’s, and, yes, Halloween. A gift basket is best when it has a theme. It is not a container for tossing in everything you can think of. With contents appropriately chosen for the recipient, your gift basket will definitely be appreciated and the items used. At this point in the year, you have time to consider selling gift baskets. Some companies, large or small, give a gift basket to a loyal customer or client. People today are used to thinking “local,” especially for food items. Your honey is definitely a local product. If you have a photo of a gift basket you made in the past you can use that for a simple brochure to advertise them. You don’t have a photo? Take a photo of the next basket you make, then continue to take photos. These demonstrate the versatility of honey-themed gifts to potential customers. Photos taken with a cell phone can easily be sent to a customer. Although you may want your label on items in a basket, some customers may wish to have the name of their business displayed. That is a reasonable request but you can ask where your own label can be placed in case the recipient of the basket wishes to buy some of your products. Just because this item is called a “basket” does not mean it must be made in a real basket. For someone just married, the container could be a cooking pot or a fry pan. Think about the hobbies of recipients. Gardening, gourmet cooking, handcrafts, painting. Think about the occasion for the basket. Yes, Christmas and other holidays, but also birthday, anniversary. Santa’s sleigh and a Halloween pumpkin could certainly be used, as well as a typical Easter basket. Look in craft shops close to holiday times. Is there some container that could be more appropriate than a real basket? If so, use it! Is there someone in your area that makes handcrafted baskets from local materials? These handmade baskets could be ideal, especially if you have a choice of shapes and sizes. Be certain the basket-maker has name and contact information on the basket. To get some ideas for containers other than baskets and also for decorations you need to visit some shops. Craft shops always have items and decorations that will help you create an individual gift basket. As you visit an assortment of shops throughout the year keep a lookout for things that would be useful for your gift baskets. Don’t forget one item that is a big help – some sort of “stuffing” that will keep the jars and other containers in place. A finished gift basket is handled many times before it finally gets “home.” Items that are a part of the gift, such as a bee-themed towel or t-shirt, can be part of the stuffing. However, depending on the size of container and number and size of items, more stuffing will be necessary. Most stores have a gigantic sale on specialized items for a few days immediately after a particular holiday or celebration. Yes, you might have to store those for a year, but it’s possible some could be used anytime. What if the recipient is a beekeeper? Think about what bee products this keeper produces. Honey? Well, if your honey is from a totally different plant source, the beekeeper may very well appreciate a jar of it. What about creamed honey, beeswax candles, soap? Not every beekeeper makes those or other such products. Some beekeepers collect bee books – is there a new one on the market? Books make a perfectly good addition to a gift basket. You can look through the beekeeping supply catalogs and find a number of things suitable for including in just about every basket. Honey candy and honey sticks are popular. Some suppliers have Sue Bee Honey Barbecue Sauce in two flavors. The wooden honey dippers make a useful addition. They come in several styles. A few honey cookbooks are available. If someone who loves to cook discovers using honey, you may have a new customer. You have a choice of quite a number of books for children of different ages. For a gardener, you could include a packet of seed for pollinators. If you are certain the recipient likes bees, you can find some potholders and kitchen towels decorated with bees. The National Honey Board has quite a collection of recipes using honey. If the recipient likes to cook, put some of the National Honey Board recipe folders in the basket. Provide the contact information for the Board so the recipient can find more recipes. 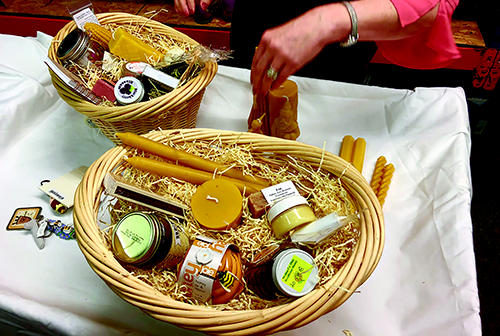 Various food items, made with honey, can be part of a gift basket. Quick breads and cookies are easily made and appreciated. Does the recipient have a dog? Make some dog biscuits using a recipe with honey. List ingredients on all cooked or baked items so the recipient knows exactly what it contains. Some honey shows have a class for gift baskets. If such a show is near you, enter one of your gift baskets. If you win a prize, take a photo to use in advertising your baskets. Some shows will specify a theme that makes entering a basket, as well as judging them, much easier. Those shows that do not give a theme usually end up with enormous baskets, with quantities of colorful wrapping and too many bows. The baskets are crammed full of everything having to do with bees and honey (except for a real hive with real bees). Many of the items may never be used by the recipient of such a basket. Check the show rules for entering to see if all the items are required to be the product of the person entering. Some people like honey and other products but are not interested in bees depicted all over everything. You want the recipient to be able to use everything in your gift basket. It does not have to feature bees but rather honey and products made with honey and wax. A very, very few people do not like honey. And some, such as diabetics, may not be able to use honey. You need to give some thought about having other main features in your gift baskets. With the variety of candle supplies available from beekeeping equipment suppliers and also just candle-making suppliers, these can be a feature item of a basket. 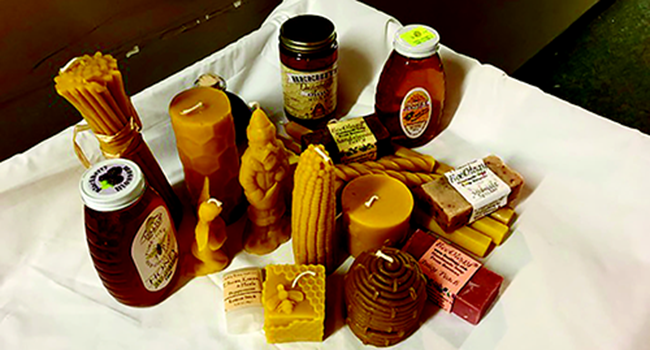 Do you or another beekeeper make beeswax candles? A beautiful pair of tapers may be appreciated. Don’t forget the colorful rolled candles and ones made from the wide assortment of molds. Beeswax in its natural color is very pretty but some may prefer colored candles, perhaps appropriate to the season or holiday. Others want colored candles to match their home décor, no matter what the season. The small decoratively-shaped candles can also be painted. If the basket has a holiday theme, such as Christmas, always have at least one candle that is appropriate. 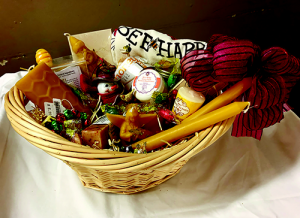 Candles are an excellent item for your gift basket. You, as a beekeeper, may enjoy creamed honey or chunk honey or just a piece of comb honey. However, someone unfamiliar with these forms of honey could be totally puzzled and really not appreciative of any of these. Someone told me a long time ago that he did not like to eat honey in the comb because the wax stuck to his false teeth. So unless you are certain that the recipient knows and likes comb honey it would be best not to use it in a basket. 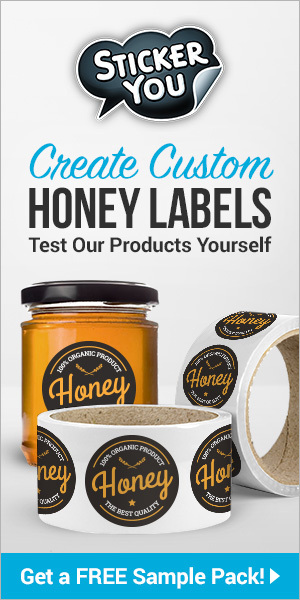 It would be possible to put a hangtag on a jar of creamed honey. The tag could explain that this is 100% pure honey, but just in another form. Explain that it was especially crafted not to be runny. Say that it can be used in all the ways liquid honey can be used. Don’t forget to add that it won’t run off of a peanut butter and honey sandwich. Sales of your creamed honey just might increase. A gift basket may need a card that has the name of the person giving the basket. Some beekeepers who are photographers do make cards of bees on flowers and the cards are usually blank inside. A message and the name of the giver can be written. If the recipient is a beekeeper a gift certificate from an equipment supplier or a queen breeder would be a nice addition to the basket. If you have obtained items, such as candles or cosmetics, from another beekeeper be certain that their contact information, as well as yours, is in the basket. Use your imagination when creating a gift basket. If you know the recipient you may already have some ideas. If you do not know the person who will receive the basket, perhaps you can find out something about the recipient. If not, then create a balanced assortment. Always keep in mind quality and design, not quantity. 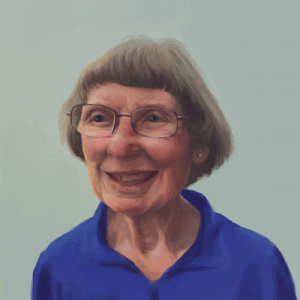 Ann Harman lives, writes and keeps her bees in Flint Hill, Virginia. CATCH THE BUZZ – New Restrictions will Require California Growers to Modify when and where Neonics are Applied.